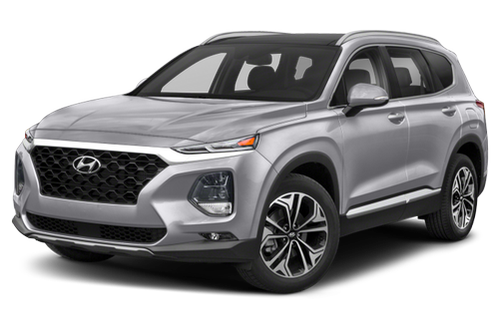 Have You Driven the 2019 Hyundai Santa Fe? I've had my Ultimate 2.0T Santa Fe for about a month. All expectations exceeded. It's superior in every way to the 2018 GMC Terrain Denali I traded in. It's hard to believe the Santa Fe is actually several thousand cheaper. The biggest difference is in qualify feel and quietness. The Terrain felt like an econobox by comparison. About the only area where the Santa Falls a little short is in fuel economy. Averaging about 2mpg less..but it does take regular fuel and the Terrain required premium. So, I guess even that comes out as a win for the Santa Fe in the end. 46 out of 46 people found this review helpful. Did you? Love everything about this SUV. I test drove 7 other brands and loved the look and interior styling. It has more tech/ safety features than all the others and had a less cluttered looking dashboard. Everything is well laid out. Love the heads up display. This was the only car in this price range to have that. Got the non turbo Ultimate model. Engine is peppy enough for me, especially in sports mode. Great sound system too. 33 out of 33 people found this review helpful. Did you? I purchased the ultimate trim. This car provides the best value for the money spent: It has every new gadget I know of and they’re all currently under the best new car warranty available. I love the 2019 body style as well as the two tone leather interior. 25 out of 25 people found this review helpful. Did you? This is my second Santa Fee and I'm lovin' it. Design--both interior and exterior are great. Reliability of this vehicle is top notch. I traded in my 2012 with 142,000 miles for the 2019. Maintenance on the 2012 was normal wear & tear--never a problem! I expect to get the same out of the 2019. Hyundai & the Dealer (Family Hyundai, Tinley Park, IL) have me for life. Nice ride. Suprising power and pick up for a 2.4L 4 cyl engine. Lots of room. Amazing saftey and driving features as standard equipment. Purchased Preferred trim package. Very nicely equipped. This car has the most safety technology of any car I've ever owned. It was a great value for a mid-sized SUV. Although I've only owned and driven it for a short while, it has exceeded all of my expectations. Vehicle looks great outside and in. Very comfortable and extremely quiet. Great smooth ride, lots of leg room front and back. good looking interior and all controls are easy to reach. I was very shocked to learn more about Hyundai. The redesigned 2019 Sante Fe is packed with all the bells and whistles anyone could want, the most amazing features to me are the safety features. The exterior feels solid and the interior is made from quality materials and feels very luxurious. I would absolutely recommend this vehicle to anyone. Bought this yesterday and am very impressed already .I am a 6'6" large man and I am comfortable in any seat. The 8 speed transmission shifts smoothly and keeps the engine in its power band effectively. It was quite surprising at the ease of acceleration and found myself exceeding the speed limit often without realizing it. The ride is incredibly smooth and comfortable. Found this to be a great value and fun to drive. This car is very comfortable, reliable, good looking. I have had 3 Hyundai cars and never had to spend a lot of money on repairs. I just keep up my normal routine care visits. Comfortable and well-equipped, the redesigned 2019 Hyundai Santa Fe should appeal to families shopping the mid-size two-row SUV class, but a few drivability issues annoy. The mid-size SUV class is poised to get a lot more competitive, with Honda and Chevrolet readying the 2019 Passport and 2019 Blazer, respectively, Ford launching an updated 2019 Edge SUV and Nissan offering a refreshed Murano. As with other Hyundai models, value for the money promises to be one of the Santa Fe's biggest selling points.